Rajasthan is packed with interesting travel options. It has big cities that offer a distinguished elite taste. On the contrary, the villages enable the tourist to peep into the less explored rural charm offered by Rajasthan. A tour to the desert land – Rajasthan will always remain etched in your memory. Let us know about some of the major places to visit in Rajasthan. Jaipur, the capital city of Rajasthan state, was built by Maharaja Sawai Jai Singh II. Since the city was painted all in pink, it was fondly called 'The Pink City'. Jaipur is packed with innumerable places of tourist interest, the major ones being Jaigarh Fort, Hawa Mahal and Amber Fort. Jaipur city amazes the visitors. Udaipur in Rajasthan is considered to the most romantic city worldwide. For this very reason, the city is often called the 'Venice of East'. Lake Pichola is a famous lake in Udaipur. A boat ride in this lake is no less than an experience of a lifetime. Jaisalmer in Rajasthan is encircled by sandstone walls. The place is known for its sand dunes. The people in Jaisalmer are quite warm at heart. They follow an interesting lifestyle. Jodhpur in Rajasthan was established by a chief of the Rathore clan, Rao Jodha. Jodhpur derives its name very much from the name of its founder king. A number of homes in Jodhpur are painted in blue. For this very reason, Jodhpur is known as the 'Blue City'. The only hill station in the desert land is Mount Abu. Situated on the top of the Aravali hills, the place has a cool climate unlike the rest of the state. The landscape of the place is rich in flora, dominated by flowering shrubs and coniferous forests. Ajmer is not only a tourist destination but also an important pilgrimage centre. The place is equally sacred to both Hindus and Muslims. The Dargah Sharif built in the memory of the respected saint Khwaja Moinuddin Chisti is a great crowd puller. Thousands of devotees come here to pray, especially during the Urs Fair. Bharatpur is a small but popular destination of Rajasthan. The Keoladeo Ghana National Park in Bharatpur is the major centre of attraction here. The park is rich in flora and fauna. Pushkar is more of a religious destination than a tourist spot. The place is regarded sacred by those who follow Hinduism. 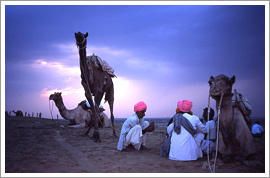 The annual Pushkar Fair attracts numerous tourists to this place. Trading of cattle is a major highlight of the fair. Pushkar Lake is also considered to be a holy lake by the pilgrims. It is believed that bathing in this lake washes off their sins. Situated on the bank of Chambal River, Kota has industrially developed over the years. Industrialization has rapidly taken place here. Kota is often known as the 'Education City'. It has several renowned institutes for higher education. Ranakpur is known for its splendid Jain temples. The sun temple and the marble Jain temple are the ones not to be missed. The beauty of these temples fascinates the onlookers. Ranakpur is one of the top five pilgrimage sites of the Jains. Located in the northern area of Rajasthan is the city of Bikaner. The splendour of the yesteryears still remains intact in Bikaner. The Camel Festival draws a number of tourists from far off places. A tour to Rajasthan shall surely exhilarate your travel zeal. There is so much to explore in Rajasthan. The state is no less than a paradise for the travelers.